Even if you’ve never been to Walt Disney World before, you’ve probably heard mention of the mammoth lines that certain attractions can generate. You might be thinking that a trip to Disney is essentially an exercise in standing and waiting, with occasional bursts of fun. While lines will indeed be a part of any Disney trip, there are steps that you can take to minimize the amount of waiting that you do and one of the best tools you have in your arsenal is the DisneyFastPass+ service, which is a ride reservation system that allows you to experience headliner attractions with minimal wait at Walt Disney World. FastPass+ is free to use for everyone visiting Disney and it can make an enormous difference in the enjoyment of your trip. There are few things that make me cringe quite as much as someone coming back from a trip and being upset because people kept jetting by them as they stood in line because they weren’t aware of FastPass+. They assumed either that it was some sort of VIP line, or that it was a special line for people that had paid extra on top of what is already a costly vacation. Don’t be that guy. 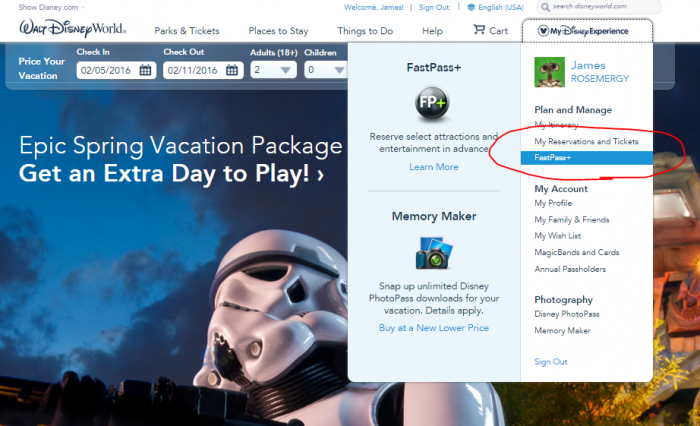 Read on to learn what FastPass+ is and how to use it! First, a little history and background to put things in context. When Walt Disney World first opened, the queues for attractions were handled the same way they might be at your local carnival — you got in line for the attraction you wanted to do when were are ready to do it, and waited your turn, which often meant standing in a really, really long line. In late 1999, Disney developed FASTPASS as a way to minimize the amount of time you had to physically be in line. To use it, you would go to the attraction you wanted to experience, put your park ticket into a kiosk, and it would print out a little ticket with a time window for you to experience the attraction with little or no wait. Once you had one FastPass, you had to wait two hours or until the start time printed on the ticket before you could get another one. This same system is used at Disneyland today, in fact. 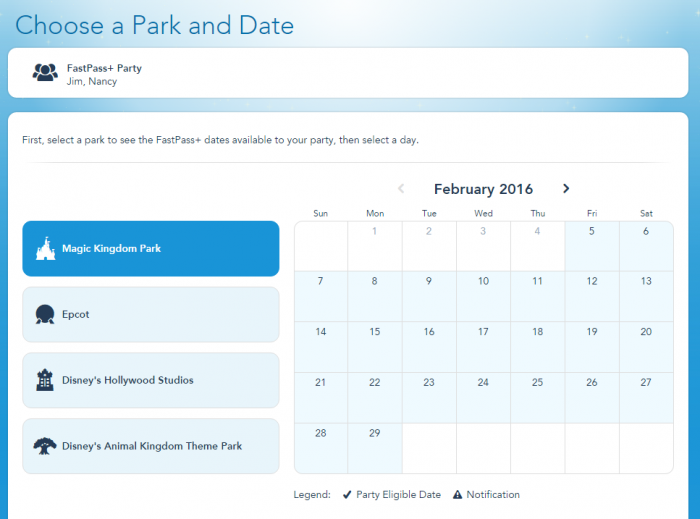 In 2013, Disney began rolling out the successor to FASTPASS, called DisneyFastPass+. FastPass+ also allows you to experience attractions with minimal wait (or, with respect to shows, with guaranteed seating), but there are a couple of significant differences between FastPass+ and its predecessor. 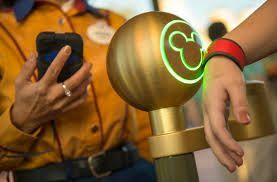 The first difference is that you do not get a ticket showing the time for you to do an attraction — instead, your FastPass+ reservations are stored electronically and linked to your MagicBands and/or other RFID-enabled ticket and you actually have some control over the time to experience it. The other big difference is that you can reserve them before you ever set foot in the park, and even when you are in the park, there is no longer a need to physically go to an attraction to reserve a time to experience it — instead, there are kiosks sprinkled around the parks that allow you to make FastPass+ reservations for any attraction in that park. There are other differences between the two systems, to be sure, but they all flow from these two major changes, and will be apparent as we continue to discuss how to use the current system if you’re used to the old one. OK, first things first — you’ll manage all of your FastPass+ reservations (in addition to dining and hotel reservations) using a MyDisneyExperience account, which you can access either on the Walt Disney World website or on the MyDisneyExperience mobile app. The app is available for iOS and Android (users of other phones should use their phone’s browser to access the Disney site), and you should absolutely install it on your phone. I’m going to walk you through the process using the website, but the process on the mobile app is essentially the same. To sign up, click on “Sign in or Create Account,” and then follow the prompts to create your account. Click “Create Account” to get started. As an aside, the Baked Alaska at The Boathouse at Disney Springs is absurd. If you already have a Disney account for whatever reason, you can use that, there is no need to create a new or different account just to use FastPass+, but make sure that it is linked to the same email account that you use for Disney-related travel, if applicable. TIP: If you have several people in your party with the same name, we recommend using nicknames or some other way of distinguishing one another when setting up your MyDisneyExperience accounts. For example, my father and I are both named “James Rosemergy.” I’ve heard horror stories about MDE having issues because it can’t figure out which James Rosemergy I am, so to avoid confusing the system, my dad is registered as Jim and I am registered as James. It was a while back when I was hearing about these problems so perhaps they’ve been resolved at this point but, you know, better safe than sorry. One of the primary benefits of FastPass+ is that you can reserve attractions in advance of your trip — guests staying at Walt Disney Resort hotels (including the Swan & Dolphin) can make reservations 60 days prior to check-in, while everyone else with paid admission (including guests of other non-Disney on-site hotels, like the Four Seasons) can make reservations 30 days in advance. Note that you must have paid admission linked to your account to be able to make your FastPass+ reservations — people just arriving and purchasing tickets at the gate do not get any sort of advance booking, so it certainly pays to get your tickets in advance if you know you’ll be going. When you go to make your FastPass+ selections, you’ll first select the members of your party for whom you are making FastPass+ reservations. From there, you will select the date and the park you’ll be in. Pick three attractions, and it will come back with 4 different itineraries including those three selections. Note that Disney will helpfully suggest Option 1 as “Best.” I’ve never really figured out how they reached that conclusion, so my assumption is that it means that it is the best itinerary from Disney’s standpoint. My advice would therefore be to ignore the recommendation and look at them all. Pick the itinerary that is closest to your ideal schedule, and click “Done” to lock the selections in. If you’re happy with your selections, that’s basically all that you need to do until you’re ready to use them! How you should decide which attractions you should pick will be discussed in a future article, but I do want to briefly discuss the subject of “tiering” now. At both Epcot and Hollywood Studios (as of the time this goes to press), Disney has grouped attractions into two tiers, and will limit you to one FastPass+ selection for Tier 1 (which tend to be the most in-demand attractions) and Tier 2 for everything else. For example, at Hollywood Studios, you are forced to choose between using a FastPass+ reservation for one of Toy Story Midway Mania, Fantasmic! or Rock ‘n’ Roller Coaster (hint: Toy Story will save you the most time), and will have to use the standby line for the others if you want to experience them. As such, when you are making FastPass+ selections at those parks, the selection screen will look slightly different, in that it will ask you to select one attraction from Tier 1, and then your remaining attractions from Tier 2. TIP: Don’t worry if the times aren’t completely perfect, as you’ll have the opportunity to tweak them once you’ve made your initial selections if you so choose. Let’s say your picks aren’t exactly what you had in mind, or you change your plans after you’ve made your initial picks? Not a big deal. At any time after you’ve made your picks, you can then go in and fine-tune them or change them entirely, either via the website, MyDisneyExperience app, or at an in-park kiosk. Unless you’re scrapping all three of your picks and starting over, you can only modify one of your picks at a time, and you can either change the time or the experience, not both simultaneously. If you’re changing the time, simply select the attraction you’d like to modify and it will give you a listing of alternative times that are available. If you’re changing the attraction, it will give you a listing of other attractions that are available that day (although note that the available times may be different than your original selection). 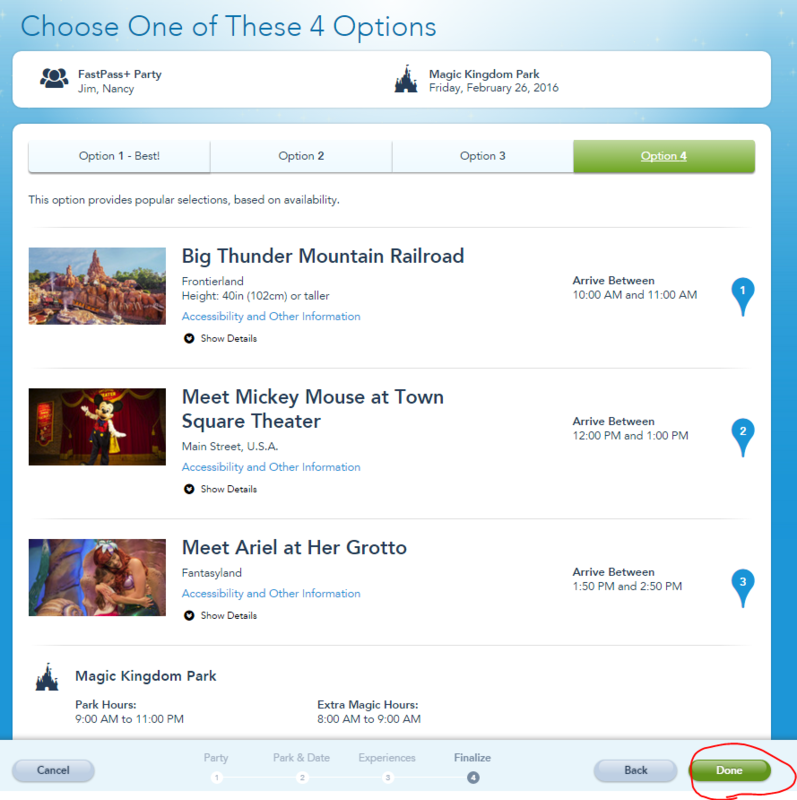 Once you select an alternate attraction, it will default to a time near your current selection, but it will also give you a listing of available time options. Note that none of the modifications actually occur (i.e., your original selections are still held) until you click “Done,” so you can feel free to tinker with them without fear that you’re giving anything up. 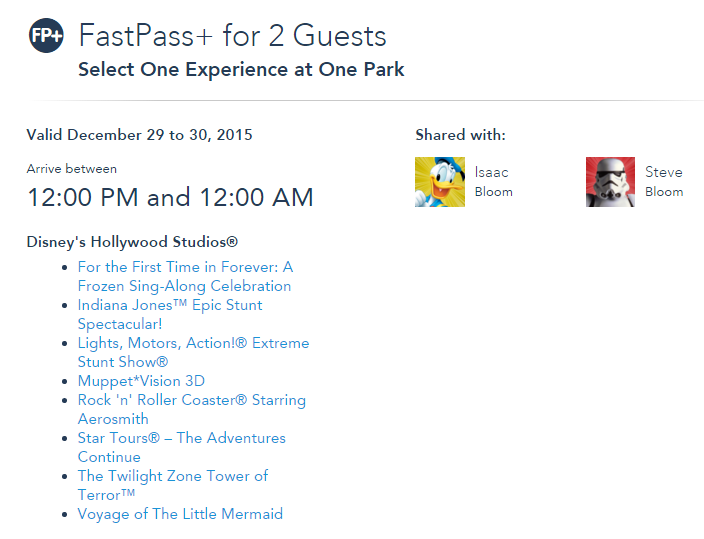 Using FastPass+ is actually very easy. Each FastPass-enabled attraction will have a separate FastPass+ queue, and you enter that queue by scanning your MagicBand or RFID-enabled ticket on the Mickey reader at the queue’s entrance. If everything is good, the reader will flash green. If not, it will flash blue and the Cast Member there will try to sort out the problem. Technically, you are supposed to show up within the one hour window for your reservation, but as a matter of practice, Disney will generally allow you to use a FastPass+ 5 minutes early or up to 15 minutes late. If at any point you forget what and when your FastPass+ reservations are, you have two options. If you have the MyDisneyExperience app installed on your phone (and you should), you can view your itinerary by opening the app — they will be listed on the home page. Alternatively, you can access your itinerary at any of the FastPass+ kiosks around the parks. You can only reserve the attractions for the park where the kiosk is physically located. For example, you cannot wrap up your three FastPasses at Animal Kingdom and then reserve a FastPass+ for an attraction at Magic Kingdom for later in the day from a kiosk at Animal Kingdom. The process of making selections at a kiosk, whether it is an add-on FastPass+ or your initial set of three is fairly straightforward. Just walk up to the kiosk and scan your band against the familiar Mickey head. 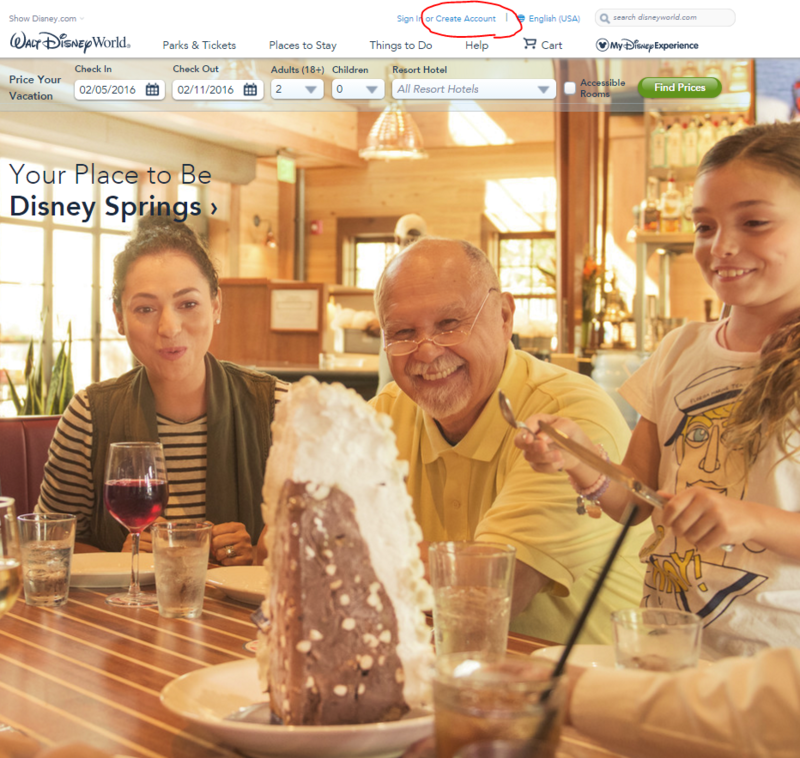 You’ll be prompted to pick the members of your party for whom you’re making the reservation, and then it will give you a list of potential attractions, similar to the process for making your initial FastPass+ selections. Touch an attraction, and it will provide a listing of available times. Click the time you want, and then follow the prompts to finalize your selection. There are Cast Members there to assist you if need be; while the process itself is pretty straightforward, they can provide good insight on what might be available sooner rather than later and what is and is not a good use of a FastPass+ if you have questions about that sort of thing. TIP: the touchscreens respond better to a fingernail than pressing with your fingertip. What if my ride is down? Disney could convert your time-and-attraction-specific FastPass into a FastPass that can be used for any of several different attractions — including your original attraction — at any time that day. The attractions that it can be used for will depend upon the attraction you originally had the FastPass for, and the more in-demand that attraction was, the more expansive your options are going to be. If it’s late in the day, Disney will give you a FastPass+ reservation for that attraction for the following day. Disney will sometimes issue what I will characterize as “bonus” FastPasses to guests, either as part of a promotion or in response to a customer service issue. They range from a specific attraction during a specific time window, just like an extra FastPass+ reservation, to something that will allow you to experience any attraction at any time of your choosing. Regardless of what kind of extra FastPass it is, be aware that it is treated differently from a regular FP+ and does not need to be used before you can make additional FastPass+ reservations. By way of example, we ended up getting one for Seven Dwarfs Mine Train on our last trip that could be used at any point during the day. We wanted to experience it at night, however, so we used our first three FastPasses as normal and then were still able to get additional FastPasses at kiosks over the course of the day even though we technically had an unused FastPass+ reservation on our account. I know what you’re thinking, why on Earth do I have to go through all of this hassle just to go on vacation? The short answer is that spending hours standing in line is nobody’s idea of a fun vacation, and a little bit of advance planning using FastPass+ will help you avoid that! Trust me, it looks worse than it is, and you’ll be working the system like a pro in no time! 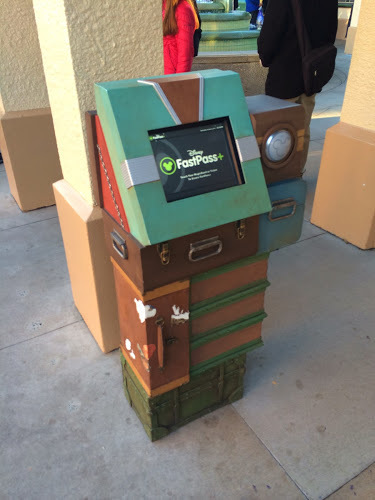 Now that you’ve got the hang of the nuts and bolts of using FastPass+, please keep your eyes open for future articles, which will expand upon it with strategy advice and even some tips and tricks to squeeze every last bit of utility out of it that you can! In the meantime, though, please leave me any comments or questions below! I’m not 100% positive, but I don’t think Disney allows this anymore. I know I’ve tried to only pick 2 FP+ (hi Epcot!) and it has automatically assigned a third. Let me also suggest starting the process of signing up for MDE and selecting FPP on a PC or Mac, rather than a tablet or phone. It saves a lot of hassle and headaches, IMO. For whatever reason, the tablet or phone apps have a lot more bugs in them and are not as reliable for the initial process. Once you have the FPP’s, modifying on the phone or tablet works well. It’s just that initial piece that can sometimes be problematic. Thanks for your comment, I would agree with this. Buggy-ness aside, you also do a lot more typing as you’re getting it setup, so having a real keyboard makes it easier (at least for me). Agreed! On the PC, you can also modify all your passes without having to click in and out a million times. I am not able to do this on my phone app. Thanks for the helpful info! I used FP+ for the first time in December (I’m used to the Disneyland paper version) and I did have one unexpected bump. When I got to Expedition Everest, the FP+ I had reserved was gone and I had no idea why. Turns out the ride had gone down at the beginning of my window but the “alert” I got was on my email, which I didn’t think to check at the park. I also didn’t know that I had received a FP+ to use anywhere — by the time I read my email I was out of the park. I ended up using the single rider line since I was alone, so no biggie, but if my kids had been there it could have gotten ugly. Now I know to check my email, but I’m wondering if there was an alert somewhere else that I missed…? I didn’t see anything on the app except that the FP+ had disappeared. Ideas? If an attraction goes down during your return time, the FP+ will turn into an anytime FastPass that you can use at almost any attraction in the same park at any time. 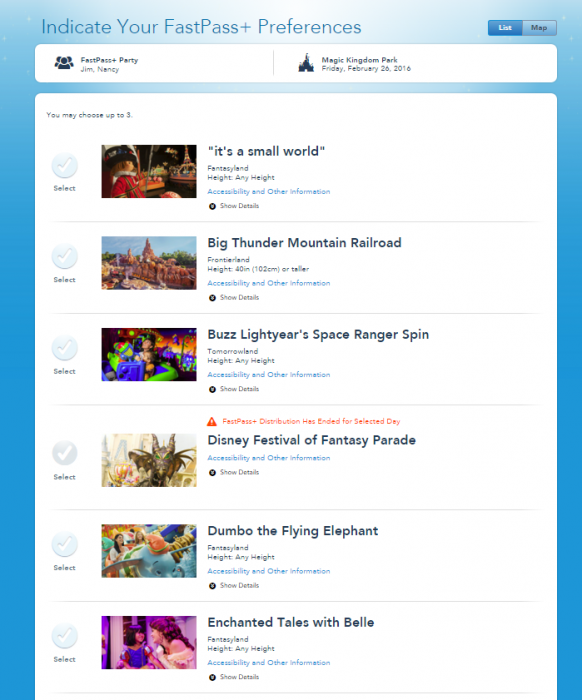 The anytime FastPass will show-up on the MyDisneyExperience app and website. Here is what it looks like on the website. One day I hit the Anytime FastPass Trifecta. Space Mountain, Seven Dwarf’s Mine Train, and Pirates of the Caribbean all went down during our return times. 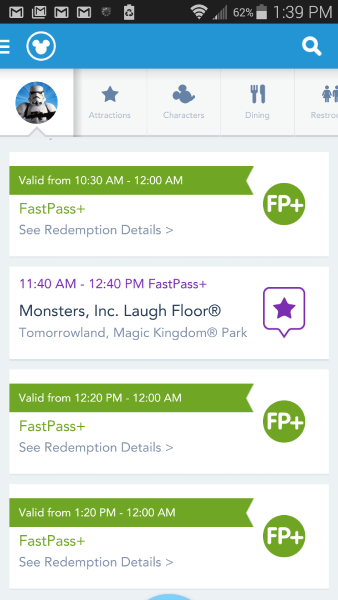 Here is what the Anytime FastPass look like in the app. I hate that! Why the app won’t send notifications I will never understand. We try to group our FP+s between 10am & 1pm. This gives us an early shot at 4th FP+s for Fireworks or Parades if they’re still available, and leaves the afternoon open for a possible nap/pool break. We plan on using both WDW’s MDE app (MyDisneyExperience) & the Lines app from this site (included with my subscription). 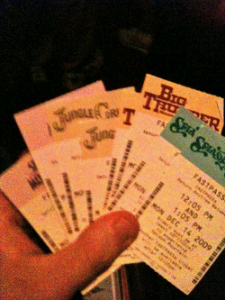 Hoping to stay apprised of rides that go down, and use these to tweak our plans around long & short lines. If your family is planning many Meet & Greets, you can buy Kenny the Pirate’s app for that. I’ve read it works well. Planning a WDW trip can sound daunting to 1st timers, but don’t worry. Work on your trip step by step, and you’ll be fine. When my son was a baby we hardly did any planning & still had a magical time, but using the FP+s will definitely give you an advantage.